The setup was perfect. I was hunting an old apple tree that was loaded with light green apples. Shortly before sundown, a nice doe walked into my stand and began feeding. I had all the time in the world. I was calm. I was ready. Finally, the doe presented the perfect angle and I drew my bow and released. I watched the arrow hit her perfectly through the chest. She ran off and I began to count down till it was time to track. A while later, I flipped on my headlamp and started walking in the direction she had ran. I walked, and walked, but saw zero blood sign. I couldn't believe it. I decided not to push her. Instead, we decided to come back in the morning. Being that I had videotaped my shot from the stand (as I usually do) my buddy and I watched the shot back at the cabin. To my horror, my shot had been perfect. I followed the bright white fletching from draw, to release, to hit. But just because my arrow went exactly where I was looking, did not mean the deer was still there. In slow motion, we could clearly see the doe had jumped string, dropping 8 inches or better at the sound of my release. In my minds' eye, I followed the arrow. In reality, the doe was hit high, and presenting us with a grim outlook for retrieval. String jumping is a reaction. The same as when someone lights a firecracker next to you while sleeping. That startled motion causes animals to react. Deer react with an instantaneous downward and rolling motion as a precursor to a "spring" escape. There is also no rhyme or reason as to how each deer jumps or how far. Some may spring dramatically while others simply 'dip a little.' It is always an unconscious reaction to a startling sound. Do Nervous deer jump more? 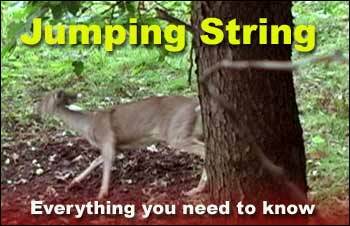 I know I'll get flack for this, but I'm not convinced that nervous deer jump string more than calm deer. I guess it would make sense that when the deer are really nerved up (like if they smelled, or saw you in the tree) that they would be more wired. But my experience has not proven that out - after 65 whitetail's taken with my bow. Some deer just seem to jump string more dramatically than others. But I have seen some differences in geography. For example, Kansas deer have been a lot less jumpy than my eastern deer in PA. CT deer (where I live) are only slightly less nervous than PA deer however they are probably equal when it comes to string jumping. But I've shot PA deer that were stomping and blowing, with virtually no string jump at all. And I've shot perfectly calm deer (like the one in my video) who dropped dramatically. I just can't put my finger on it and have decided that all deer react differently, especially given external conditions such as wind, other sounds, etc. If you're like me, you've probably missed a deer clean on an occasion or two (or three). Inevitably, the first shot creates the most dramatic reaction from the deer. However, subsequent shots result in less reaction. The deer actually "get used" to the sound and prepare themselves for it. This has always amazed me. Logic would dictate that arrows whizzing by them would make them unglued - but the opposite is true in many cases. The Million Dollar Question - should you adjust for it? Again, I know I'm going to catch flack for this, but I'll say yes - you should adjust for a possible string jump by aiming slightly lower than you would on a foam deer. Note, I said "slightly." By aiming at the top of the lower third divider (divide the deer into 3 horizontal lines) you are, or at least should be around the top of the deer's heart. If the deer jumps, you should get both lungs. If the deer does not jump, or only slightly, then you will heart shoot it. If you go low, you will have a better blood trail than going high. While it's hard to mentally force yourself to shoot low - I think more deer would be recovered if this happened. At least mine would. Does the Bow make a difference? Yes and no. Most of my visitors know that I shoot longbows and recurves. These bows are inherently quieter than compounds. Some of these new, lightweight compounds sound like a .22 when they shoot, however what you gain in decibels, you will typically, also gain in speed. The faster the arrow gets to the deer, the less the reaction will cost you. The flip side is true for my trusty recurves. They are not shooting 300 fps, at best 200 fps and more like 185. This dramatically slower (albeit, quieter shot) arrow allows the deer to move further before the arrow hits. Does range make a difference? I've heard guys mention that if you hunt further from the deer, the jump is much less, or non-existent. I would happen to agree with this based on the few occasions where I've taken a longer-than-normal shot. However, my personal opinion is the increased distance adds vital time for the arrow to reach the target. Couple this with a greater room for errors like the ability for external factors to come to play (like wind) and I think the risks outweigh the benefits. I've shot moose, grizzly, mt. goat, african animals, black bears, turkeys and many others. I can say with experience that I've only witnessed jumping with whitetails. For the big critters, like elk, moose, and big bears, they simply can't move as fast as a whitetail and I'd have to say that string jumping should not be an issue. I've shot 3 pronghorn and one mule deer and they did not jump either. Of the 4 turkeys I've shot, none have flinched.. So based on my experience alone, I'd have to say this is primarily an issue for whitetails. Deer jumping is a common problem for whitetail bowhunters. But with experience, and a slightly lower target point, I'm confident that the "jump" reaction risk can be mitigated. 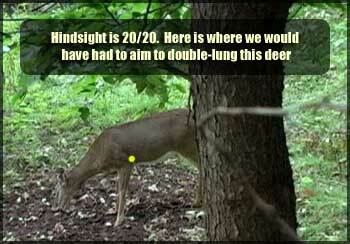 I don't recommend a radical aiming point (like the photo above) because there's just too much variation between deer. In the end, the best result is a quick clean kill, so find out what works best based on your experiences and use that method.